A meal, a bargain, a discovery and an old favourite. The original plan was to go and taste some wine in Dolceacqua (Filippo Rondelli’s Terre Bianche), but understandably on a Sunday in the middle of harvest, this was not going to happen, so four of us headed off to Apricale for lunch instead. 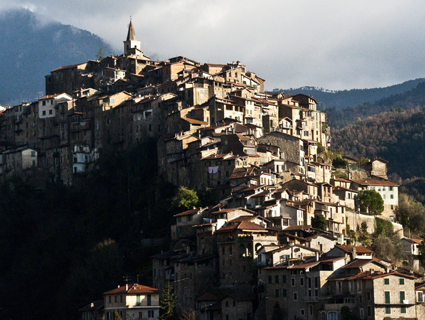 It was Filippo who had first recommended this breathtaking village, situated on a blade of mountain like something from Tolkein’s Middle Earth, and I had visited once before, but my friends never had. 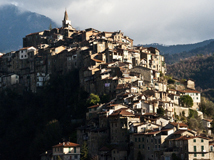 Apricale also boasts a number of really good restaurants, of which probably the best is Da Delio. It serves the characteristic local dishes (plenty of rabbit, boar and pesto), but presented slightly more artfully than usual, and with great attention to service. In fact I don’t think I've seen quite so many waiting staff at an Italian restaurant on a Sunday, and certainly not for the reasonable prices they charge. The wine list got passed around and I had spotted one of those too-good-to-be-true entries so I pointed it out. 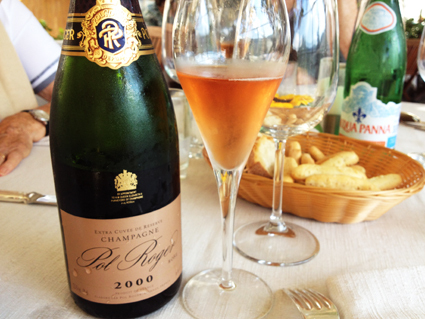 Now, Pol Roger is a great Champagne house (although not particularly noted for its Rosés to my knowledge). 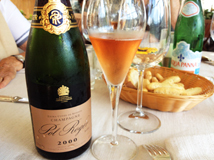 But a vintage rosé from a great year, from a great house, in a good restaurant, would normally cost an awful lot. It was €100 here (subsequent checking suggests this is about the current retail price, not that many people have any left). I suppose €100 is a lot of money for a bottle of wine in some ways, and to drink Champagne in Italy is a bit odd, but not for this. Amber-orange with a fine mousse and a simply wonderful aroma of brambly Pinot Noir fruit with rosehip, and fruitcake. It was mouthfilling in that soft creamy way that only Champagne with some age can offer, and no harsh edges at all. The finish was soft, long and supremely smooth and rich. A great Champagne and an absolute bargain. My first course was “Rabbit in the Tuna style”. Well, you would wouldn't you? Someone had to order this and I'm glad I did. It was a rolled ballotine of rabbit served with a tuna sauce (à la vitello tonnato). Very good indeed. I have to be honest and say I really didn't know anyone had Carmenère in Italy. But at Ca’ del Bosco, - a very good producer - they have been producing this single varietal wine since 1993(!). 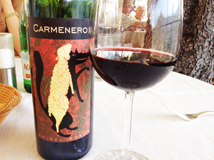 Carmenère is a variety that left Bordeaux before Phylloxera, and never really returned (until recently). Grown widely in Chile, and scarcely anywhere else, it was often mistaken for Cabernet Franc in terms of flavour, and for Merlot in terms of how its leaves looked (once upon a time, the greatest arbiter of which variety was which). This wine, again from the 2000 vintage, was €60 on the list, and worth every penny. There was plenty of tannin and oak, and it probably would have been quite a mouthful when younger, but at this age the tannins had softened enough, and the crunchy purple fruit was delicious and well structured. It lacked a certain something in the midpalate, but I have found this with Carmenère from elsewhere too. It went exceptionally well with a Costata Nobile di Manzo (côte de boeuf). We had some difficulty convincing one of the party that the label was a wolf in sheep’s clothing as opposed to a sheep shagging a wolf. But if it was the latter, then it didn't look as though Larry was enjoying himself much. To round it off, we had a collection of cheeses and desserts which we all shared (how does or could anyone eat a whole portion of zabaglione with those mini doughnut things on their own? There were four of us, and still most of it left). The cheeses were excellent, as was the crumbly olive oil cake with olive oil ice-cream, and olives. Personally I felt that this ran the risk of being just a bit too, er, olive-y, but actually it was perfectly balanced. And what wine could go with all this? At €7 for a (very generous) glass, this is just as much of a bargain as the Champagne was I think. 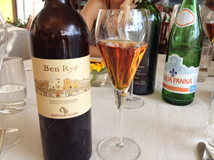 It is truly one of the world’s great sweet wines, and as good as any Vin Santo to my taste. Intensely sweet and yet with fresh orange-water crispness to accompany its plethora of marmalade, apricot, grape and sultana flavours, it manages balance and intensity – a rare feat. Superb, and dangerously easy to gulp (the acid test of a good sweet wine). It occurred to me that we hadn't tried any of the local Rossese di Dolceacqua, which had been the original intention of the trip. But fortunately – as it fairly common in my life – it was Grappa to the rescue with a smooth Grappa di Rossese, which went exceptionally well with the espresso coffee that somehow manages always to taste better in Italy. The whole bill for four of us came to €340, so I suspect the Grappa was probably even free. Bargain. A terrific meal in a lovely place with excellent people. Will be back!